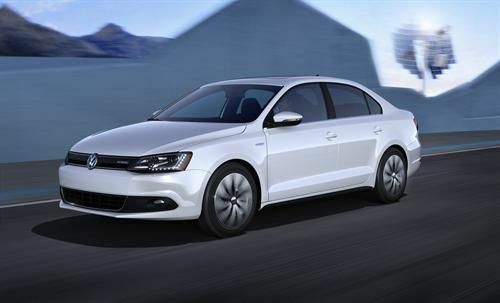 With the official launch of the 2013 Volkswagen Jetta Hybrid onto the U.S. market, at an EPA rating of 48 mpg on the highway (45 combined), VW now claims the best highway fuel efficiency in America with seven models on the market that achieve 40 mpg highway or better. Besides the Jetta Hybrid, Volkswagen also has the Beetle TDI, Beetle Convertible TDI, Jetta TDI, Jetta Sportwagen TDI, and Passat TDI all achieve 40 mpg highway or better. With those seven models, Veedub now has more models available in the U.S. that achieve 40 mpg or better than any other manufacturer in the United States. Quite an achievement and one that many people might be surprised at, given the amount of press other manufacturers routinely get for their green efforts. The flagship of this effort is the new Jetta Hybrid, of course. This is VW's second hybrid in the U.S. - the Tiguan Hybrid was first - and the first time the company has put one in the compact hybrid sedan segment, which pits it against some of the most well-established hybrids on the road. The 2013 VW Jetta Hybrid has a lot going for it, though. Starting at $24,995, the Jetta Hybrid S uses a 1.4-liter, turbocharged and direct-injected TSI® engine mated to an electric motor and a 7-speed DSG® dual-clutch automatic transmission. This is unique for this class and despite the 170 horsepower and 184 pound-feet of torque the Jetta Hybrid produces, it achieves that 45 mpg combined easily. While it might be surprising to see that Volkswagen holds the title for most fuel efficient, the 40 mpg benchmark is one that many automakers are aiming for and beginning to beat with regularity.